Home/Roof/What Is A Standing Seam Metal Roof? Standing seam metal roofs provide a modern roof profile that looks simply stunning on any home or commercial building. Standing seam panels are a popular choice that offers a classy updated and vastly improved take on the strong profile of corrugated iron. Standing seam panels can be used for roofing and wall claddings, and feature weathertight seals that are formed through a series of machine sealed vertical lips. Standing seam panels are durable and are suitable for a range of applications including vertical and near horizontal cladding situations. Standing seam panels come in three basic styles: Standing seam, Snaplock, and Nail strip to cater to a wide variety of applications. 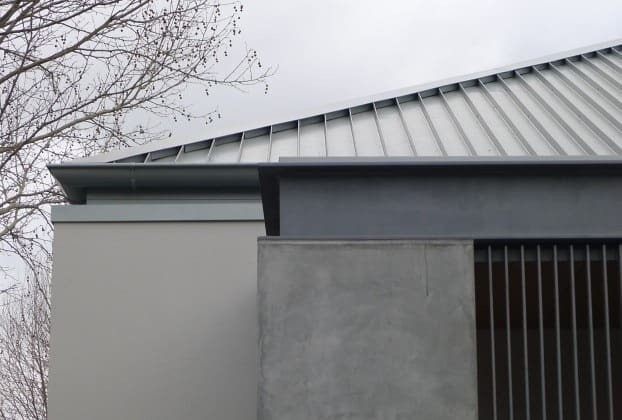 Metal roofing has been around for a long time now and traditional products such as zincalume and galvanised corrugated iron have proven their usefulness as a roofing solution but they have some significant disadvantages compared to standing seam. Which Is More Weathertight: Standing Seam Or Ordinary Metal Roofing? One of the most critical advantages of standing seam over ordinary metal roofing materials lies in standing seam’s superb weathertight design and the ability to form a virtually 100% watertight seal. Ordinary metal roof sheets rely on a significant overlap of some 200mm to prevent water intrusion but this is sometimes just not enough in cases of windblown rain or capillary action that can even drive water up hill and into the roof cavity. In contrast, standing seam panels use a system of 25mm to 38mm vertical ridges or lips that are crimped together to form a vastly superior and virtually impenetrable seal. Weathertightness and appearance is further enhanced by the clever use of concealed screws. Which Is More Versatile: Standing Seam Or Metal? Standing seam panels offer significant advantages for flexible design and use. Long-run panel lengths of 8 m or more allow a much greater range of options for external wall and roof cladding than ordinary steel roofing. From nearly horizontal (1.5°) to vertical applications standing seam panels allow you to fulfil your dream design vision. For corners, cones, angles, and domes, and anything else you might imagine standing seam is the optimal choice. Which Is Stronger: Standing Seam Or Metal Roofing? The interlocking lip technique enhances the superior strength of the standing seam joins. Standing seam panels are installed over 15 to 19mm ply panels, which provide additional support and strength. Concealed sliding clips attached by countersunk screws absorb any movement in building materials and provide a sleek seamless look. What Are The Three Standing Seam Options? Rib joins are sealed using a crimping machine. Is similar to standing seam but the panels are snapped together without crimping. Nail strip panels, in many cases, can be simply attached directly to the roof or wall structure without the need for either fixing clips or crimping and this means installation is fast and straightforward. Standing seam, Snaplock and Nail strip are the perfect solution for your roofing project. They look right at home on any roof from old bungalows to modernist apartments. Successful installation of standing seam roofing requires a high level of expertise. If you want the job done properly the first time call the standing seam metal roofing experts, call ARC now.